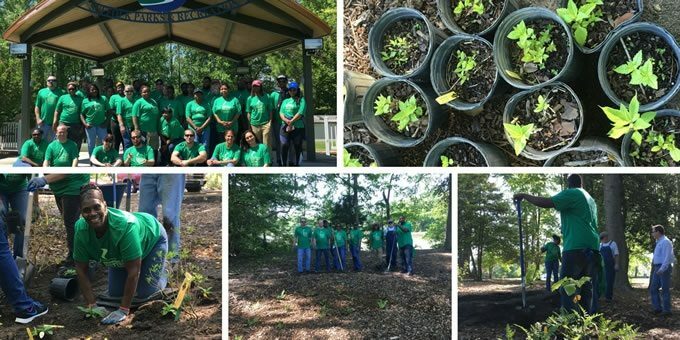 Corporate volunteers from Keurig Green Mountain join Suffolk, VA locals in a community-based project to protect and preserve the waterways within the area. 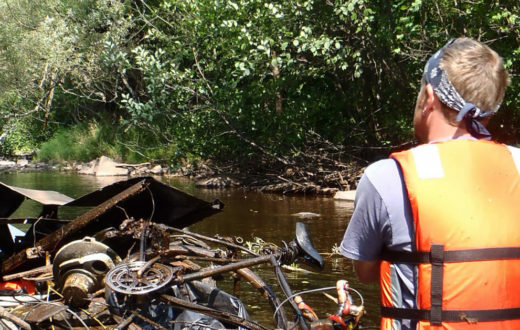 After continuous participation, many of the volunteers feel that they, too, can make an important impact on the protection of the environment. At the end of April, American Rivers teamed up with Keurig Green Mountain employees in Suffolk, VA and the Nansemond River Preservation Alliance (NRPA) to install five rain gardens, plant 30 native shrubs, and enhance a 100-foot buffer along Bennett’s Creek, a tributary of the Nansemond River. To talk more about the work we did and the importance of buffers, we’ve asked Elizabeth Taraski of Nansemond River Preservation Alliance to guest blog. Restoring the impaired waterways of Suffolk, VA requires a sense of community collaboration. 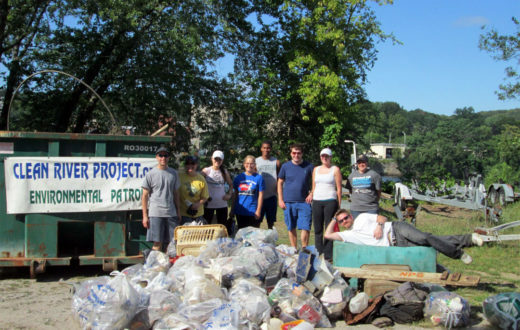 The Nansemond River Preservation Alliance (NRPA), launched in 2010, has been working diligently to educate and encourage citizens to be environmental stewards. One of the key elements at the core of NRPA’s strategy and business plan involves community collaboration, as well as working with like-minded organizations. The partnership between NRPA and Keurig Green Mountain (Keurig) is known as one of the success stories on the Suffolk waterways. The partnership began in 2012 when Keurig provided grant funding for the NRPA Nansemond Watershed Initiative (NWI): Connecting the Classroom with the Environment, a program for seventh grade students. Over a two-year period, 2,000 students participated in NWI indoor and outdoor hands-on classroom experiences. In 2015, Keurig and NRPA collaborated on a community-based project that emphasized the importance of conservation, and how it protects the waterways. Spreading 105 cubic yards of mulch. In order to be successful, the NRPA worked in collaboration with the Suffolk Parks and Recreation Department to plan and manage the project. The NRPA also provided guidance to employees on how to properly plant shrubs. Collaboration and planning are the key elements to the program’s success. Both Keurig and American Rivers recruited the volunteers, as well as provided the funding for plants, supplies, and refreshments. Most of all, Keurig and American Rivers lifted the momentum for volunteers with plenty of support and enthusiasm. Immediately after day one of the project, a rain storm drenched the planting site with nearly 1.5 inches of rain. The rain gardens planted earlier in the day were put to the test. NRPA is delighted to report the rain gardens were effective in their mission by reducing storm-water runoff. The riparian buffer is also currently stabilizing as a result of the Keurig’s three years of volunteer work. 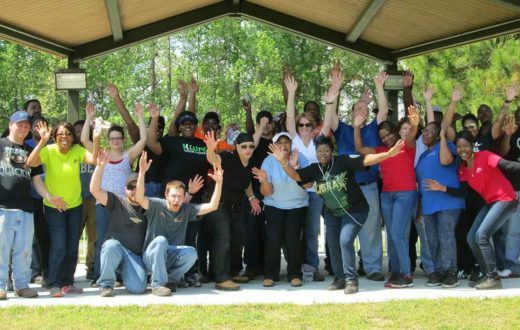 Keurig employees have embraced this project as upwards of half of the employees who participated in the past returned to help again. Employees who were new to the program shared that this was their first experience volunteering for an environmental project. It was also the first time that they had the opportunity to plant a native shrub or a tree. Many had never heard of or seen a rain garden. By the end of the day, several were talking about planting their own at home. Ecological restoration of rivers is very important and happening in conjunction with dam removal on the Boardman River in Michigan. Other rivers such as the Scioto in OH and Buffalo Bayou in TX are benefiting from ecological restoration. I live in Traverse City where three dams on the Boardman River have been removed. The river is flowing freely again, unencumbered after 100 years of confinement..
We are all excited to be able to paddle the new river that now flows where lakes and ponds used to be, Beautiful. Right? Surprisingly, removing a dam is not always a happy event for everyone. Fishermen miss the lakes they used to fish on. Home owners lose their lakefront. The land that is exposed as the water recedes is barren and devoid of life – ugly is another word for it. And now, places where native fish and wildlife were free to live protected by a barrier (dam) that kept out invasive species are now in danger of being displaced by new species that will compete and in most cases destroy their habitat. 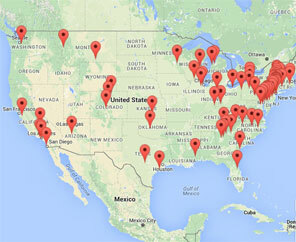 That is what is happening here and we are working hard to keep that from occurring. It may be too little too late. i hope not. So, if you think that taking out a dam is always good for a river, think carefully about what you wish for. It’s not always soft lights and roses.